Announcing:Annual All-You-Can-Eat Pancake Supper for $7.00!! Come enjoy the pancakes and delicious sausage & bacon from Kennedy's of Weatherford! 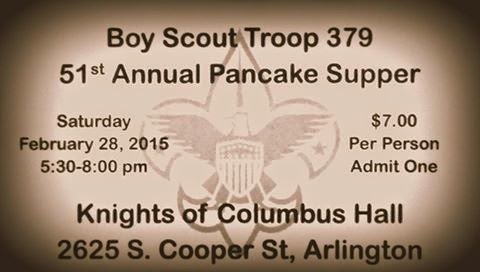 This is going to be an awesome event as it is Troop 379’s 51st annual pancake supper! Let us know if you're interested and we will get the tickets to you!! Thank you for your support!! 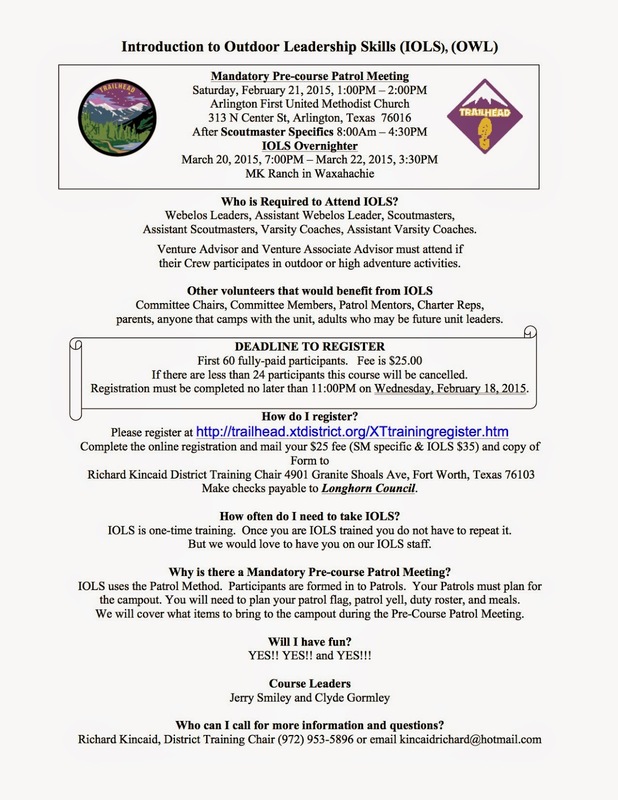 Who is Required to Attend IOLS? Assistant Scoutmasters, Varsity Coaches, Assistant Varsity Coaches. their Crew participates in outdoor or high adventure activities. parents, anyone that camps with the unit, adults who may be future unit leaders. If there are less than 24 participants this course will be cancelled. Registration must be completed no later than 11:00PM on Wednesday, February 18, 2015. Make checks payable to Longhorn Council. How often do I need to take IOLS? IOLS is one-time training. Once you are IOLS trained you do not have to repeat it. But we would love to have you on our IOLS staff. Why is there a Mandatory Pre-course Patrol Meeting? IOLS uses the Patrol Method. Participants are formed in to Patrols. Your Patrols must plan for the campout. You will need to plan your patrol flag, patrol yell, duty roster, and meals. We will cover what items to bring to the campout during the Pre-Course Patrol Meeting. Who can I call for more information and questions? New chartered organization personnel, Scoutmasters and Assistant Scoutmasters, committee members, commissioners, and other adults involved with the troop should attend. I am unable to upload to the FTP at the moment.. here is the link to the current list. If you have any issues please leave me a comment, or call me..
We currently do not have a Cross Timbers Day Camp Director or Program Director locked into place. The children of Arlington need you. We will send you to camp school, I have the budget from last year we can use, we will put on proper training and meetings beforehand to ensure proper communication. Please help us! Attached is the guide. Page 24 and 30 are good references for the job description. Our first kick-off meeting is in January and I have NO ONE. Please don't just discard this email- I need names of people I can call to ask for help. Is it CHAOS or CONSTRUCTIVE DISARRAY? Here's how you can help your troop's youth leaders take charge. IF YOU WANT TO KNOW how not to create a Scout-led troop, talk to Dale Werts. In the fall of 2012, Werts' unit, Troop 714 in Edgerton, Mo., decided to become completely Scout-led. The adult leaders made the switch quickly — the youth leaders, not so much. Given the chance to sink or swim, the Scouts promptly sank. "The adults got the message to step back and let the boys lead, but the boys had never done that before; they didn't do it in Cub Scouts, and they hadn't done it in Boy Scouts yet," recalls Werts, an assistant Scoutmaster. "So when the adults stepped back and the boys didn't immediately start humming like a finely tuned machine, it kind of foundered. Camping suffered; meetings were not organized; fun was not being had." The failure discouraged the troop's adults, but it didn't deter them. They regrouped and developed a transition plan built around three key strategies: training Scouts, training adults and training parents. In the fall of 2013, they tried their Scout-led experiment again — this time with better results. "The boys are doing everything," Werts says. "They're feeling more empowered, and they're also feeling more accountable. When something goes wrong, they don't immediately point to some adult." And what about the adults? "The adults say, 'This is cool. I don't have to work as hard,' " Werts says. With a solid plan, you and your fellow Scouters can also discover just how cool Scout-led troops can be. Here are some tips to get you started. 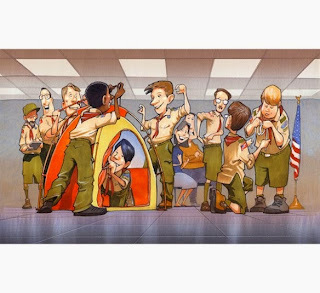 One of the first things you should do is decide just what you mean by "Scout-led troop." Consider these questions, for example: What is the role of adults in a Scout-led troop? 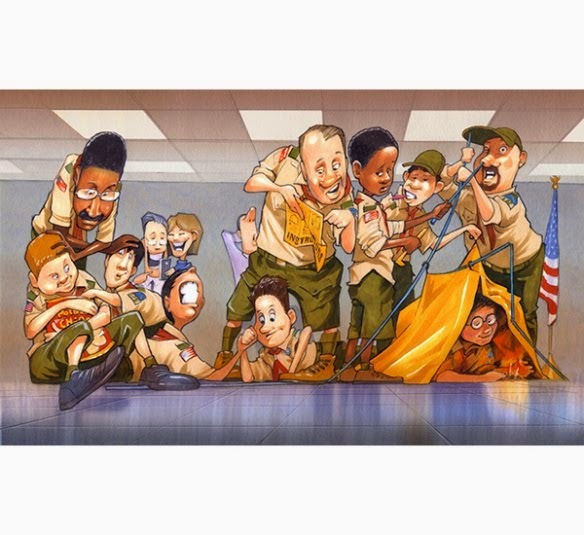 How involved should adults be in troop meetings and patrol leaders' council (PLC) meetings? When should the Scoutmaster exercise veto power? Should he or she even have veto power? What happens when the PLC drops the ball? According to Assistant Scoutmaster Joe Smith from Troop 1002 in Richmond, Texas, many Scouters mistakenly think a troop is either Scout-led or it's not. Instead, he points out that being Scout-led is "a spectrum, not a condition; the level of independence given to the boys is dependent on the maturity and cultural personality of the troop." Moreover, no matter how much authority you give your Scouts, you can never delegate your responsibility as an adult leader. That obviously means stepping in before health and safety are threatened, but it also means backing your Scouts when their good-faith efforts turn out badly. "Angry parents get to deal with me and not the Scouts," says Patrick Provart, a pack committee member in Springfield, Ill., who has twice served as Scoutmaster. "Rest assured that the Scouts and I will be talking later." If your adult leaders all have different ideas of what it means to be a Scout-led troop, your transition will be rocky at best. Before you make any changes, make sure everyone has the same vision in mind. That was especially important when Troop 1882 was founded in Haymarket, Va., in 2012. The troop consisted of 15 graduating Webelos Scouts and their parents (along with one slightly older Scout), so it was important for the adults to make a smooth transition to Boy Scouting. "We made sure the Scoutmaster and all assistant Scoutmasters were fully trained, and three adults immediately attended Wood Badge," says Scoutmaster Matt Gallagher. "We felt the adults needed to set the tone and get as much knowledge as we could as to how it 'should' be done." Two years later, the troop has more than 40 active Scouts — and a group of leaders who continue to share a common vision. "That's one very good thing we have, from the committee to the assistant Scoutmasters," Gallagher says. "We all talk about being 'checks' on each other to make sure we don't impose our will on the Scouts." While many adults have led groups before, most Scouts haven't. That's why it's important to hold Introduction to Leadership Skills for Troops (ILST) and to get as many Scouts as possible to attend National Youth Leadership Training (NYLT). NYLT has been a top priority for Werts' troop, which subsidizes the cost for its Scouts. "This summer, we had two boys on staff and five boys attending as participants," he says. "These boys are all seeing and experiencing how a boy-led troop operates." Since Gallagher's Scouts have been too young for NYLT, he has made ILST a priority. He emphasizes the importance of running ILST for each group of new leaders. "We didn't do one after the last elections we had, and I'm kind of kicking myself for not pushing that harder," he says. "On our annual plan now, for the weekend after troop elections, there will always be an ILST." Besides formal training, Troop 158 in Shrewsbury, Mass., held a leadership retreat before it made the transition to youth-led, says Thomas Bodden, who was senior patrol leader at the time. Thomas, his assistant senior patrol leaders, the troop's patrol leaders and a few adults spent a weekend at a cabin where they discussed the Patrol Leader Handbook and Senior Patrol Leader Handbook, watched the Scout movie Follow Me, Boys! and talked about how they wanted the troop to run. "That really set the stage for us," Thomas says. "We drew the line and said, 'OK, we're starting boy-led now.' It was definitely a daunting task, but it was definitely successful." According to Thomas' mother, Erica, it's important to get parents on board. Take the first day of summer camp, for example. "Dads would (previously) help the boys set up their mosquito nets and lay out tarps and things like that," she says. "When our new Scoutmaster took over, we were basically told, 'OK, everybody go home.' That surprised us old-timers, but he was right." That doesn't mean newer parents always understand the Scout-led concept. "When their boys were Cubs, the parents called the shots and ran things," Werts says. "When their boys cross over to Boy Scouts, these parents generally need to be taught that Boy Scouts operate differently. This is not self-evident, although a lot of troops think it is and never explain it to the parents." To educate parents, Werts' troop created Boy-Led Troop 101, an informal training course it offers alongside troop meetings in the fall. "Boy-Led Troop 101 is all about letting parents understand that it's OK to let your kids fail; they learn from that," he says. "Once you explain it, parents will usually make a good effort not to interfere, although they don't always succeed." As you make the transition to a Scout-led troop, you can expect to work harder than ever — at least for a while. Your 11-year-old patrol leaders don't know how to control their peers, and your 13-year-old senior patrol leader might never have run a meeting. When Shaye Larsen took over as Scoutmaster of Troop 52 in Pleasant View, Utah, seven years ago, he focused on coaching his new senior patrol leader. "It takes a lot of work to make sure he is prepared — meeting with him before meetings, having reflections after meetings, meeting with him and his parents regularly, calling and texting often," Larsen says. "It was a lot of behind-the-scenes work on my part, but it paid off. The SPL started getting more confident and capable, and the troop flourished under his leadership." Supporting your youth leaders also means giving them space — sometimes literally. Gallagher, for example, leaves the room during PLC meetings. He also gives youth leaders permission to tell him, "We've got this." "When I see them looking to me more," Gallagher says, "I try to back off and start asking more questions." Finally, you have to be willing to embrace a little chaos. "That's a natural condition that's going to exist anywhere you have boys in charge of anything," Smith says. The trick, he says, is knowing when and how to step in (short of obvious health and safety situations). "Ultimately, that chaos is the opportunity for these kids; it's how they're going to learn in a group," he says. "You have to learn to be comfortable with some of it and to recognize when the chaos has become completely unproductive and is turning some other kids off." Just remember that when you end the chaos, you end the learning that boys can get only in Scouting. "If you don't go through Scouting, how can you say you were in charge of 40 kids, the budget for a troop, the whens and wheres of everything?" asks Thomas Bodden, a former senior patrol leader. "You can't do that without Scouting. If the troop's not boy-led, the leaders are essentially a damper on this experience. They're not giving the kids the full opportunity that Baden-Powell intended." Although Cub Scouting is adult-led, there's plenty of room for Cub Scouts to learn leadership skills. Den leaders and assistant den leaders can lead ceremonies and games, while all boys can learn by watching a den chief, a Boy Scout who assists the den leader. To help Cub Scouters better understand what boys are capable of, Pat Meadows of Richmond, Va., relies heavily on Boy Scouts during the Outdoor Leader Skills for Webelos Leaders courses she runs. "I mentor the boys, and the boys do the leading," she says. Helping Meadows has let Boy Scouts hone leadership skills they've used back in their home troops and beyond. As the Cub Scout leaders in attendance witness examples of youth leadership, they see the potential for leadership (albeit, in age-appropriate doses) among their own Cub Scouts. "The youth of today will be the governor or president of tomorrow," she says. "We really do need to set the youth up for success." SHARE YOUR TIPS for boosting boys' leadership skills in a troop setting, below. Plan to get outdoors in the New Year! Please remember that all donations must be received or postmarked by midnight Dec. 31 to take advantage of 2014 tax benefits. You can donate online at www.riverlegacy.org, in person at River Legacy Living Science Center or via mail to 703 NW Green Oaks Blvd., Arlington 76006. River Legacy Living Science Center Closed Jan. 1 for New Year's Day. 2 pm, Jan. 3, River Legacy Living Science Center. Discover the habits and adaptations of a native animal during a live animal observation with a River Legacy Naturalist. FREE. RSVP to 817.860.6752. 11 am, Jan. 17, River Legacy Living Science Center. Children of all ages are invited to listen to fun, seasonal stories presented by a librarian from Arlington Public Libraries. Stay after for related craft or activity. FREE. RSVP to 817.860.6752. 9 am, February 9. For students currently enrolled in education programs or enrolled in summer classes last year. Open registration for Nature School begins Feb. 16 and open registration for Summer begins Feb. 21. River Legacy Living Science Center has partnered with Dallas Sierra Club to offer an "Outdoor Doubleheader" in January teaching the basics of camping and backpacking! Discover outdoor gems hidden within a few hours of the DFW concrete jungle during this presentation led by Wendel Withrow, author of The Best in Tent Camping - Texas. Learn tent camping basics and discover some great hiking trails and tips for venturing into the great outdoors. Cost is $30. Books available for just $10 that day only. Stay after for autograph. Leave the crowds in the campgrounds! Backpacking enables you to move into backcountry serenity, granting access to trails where your car can't take you. Dallas Sierra Club outing leaders with decades of experience leading multi-day backpacking trips will share what you need to know to begin or enhance your own backpacking experiences. Bring a sack lunch or a drink and a snack. Cost is $30. Doubleheader Special: Sign up for both classes for just $50! Space is limited. Please RSVP to 817.860.6752, ext. 102. Payment is due at time of registration. River Legacy Living Science Center is offering training in Core and Advanced Water Quality Monitoring for the Texas Stream Team, a cooperative partnership between The Meadows Center for Water and the Environment, The Texas Commission on Environmental Quality, and the U.S. Environmental Protection Agency. Texas Stream Team members make a difference for our Texas waters by collecting water quality data about our natural resources. Become a certified Texas Stream Team Citizen Scientist by attending Core Training from 9 am to 3 pm on Saturday, Jan. 31. After this session, volunteers can collect water quality data for local water protection projects. Become certified for advanced water quality monitoring on Saturday, March 7 from 9 am to 3 pm. After this session, volunteers will be qualified to collect additional water quality data such as nutrients and bacteria. Space is limited, reservations required. To register for these free trainings or to learn more, call 817.860.6752, ext. 105. Future environmental stewards start here. Make a difference. Support the work of River Legacy Foundation.